Ready to say goodbye to plastic baggies and other plastic food containers that can leach harmful chemicals into food? Straight from our collection of BPA-free food containers, this stainless steel bento lunch box is great for packing a child's lunch. It is made from lab-tested, food-safe stainless steel. When it comes to filling our lunchboxes with food for school or the office, we reflexively turn to the usual plastic containers and throw-aways, which generate an enormous amount of waste. These bento-style lunch boxes are a perfect solution for a non-toxic and safe lunch, while also minimizing waste. 2-layer lead-free stainless steel bento lunch box with upstairs inner box. The closures on these BPA-free food containers are kid-tested and will not snap little fingers. 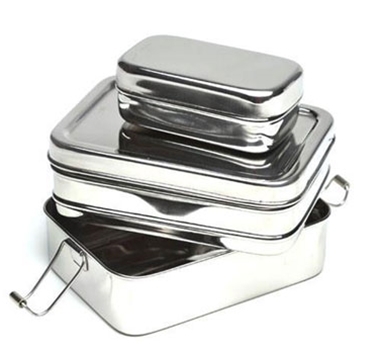 Steel lunch containers are dishwasher safe. BPA-free food containers made in India. The bottom layer is 1" deep and fits a whole sandwich on sliced bread. The top layer is 1 1/2" deep and fits cut fruit, dry snacks, pasta or salad.